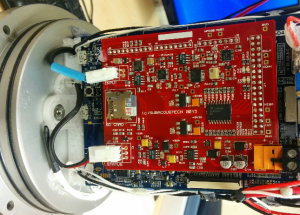 The remit from UK based underwater specialists Subacoustech was to design and build an ultra low power system the would be capable of continuously capturing audio at frequencies up to 384KHz and work on deployments of up to 60 days. The system was required to perform live FFT transformations on the sound picked up by a hydrophone and record the audio to a micro SD memory card either periodically or when level triggered threshold events occur. The hardware design was based on an Atmel ATSAMA5D44 ARM based motherboard connected to a daughterboard using a TI ADS8327 16bit ADC over a 4 wire SPI interface. The preamp had digitally controlled filtering and gain settings that made it possible to connect the system to many different hydrophones of both active and passive types. The daughterboard also contained a micro SD flash card holder that connected to the microcontroller via a second 4 wire SPI interface. The power supply input voltage was specified as being from 6V to 36V in order to accommodate a number of battery configurations and to enable the system to work as long as possible when the voltage dropped well below its nominal voltage. The peak system power consumption when writing data was just over 1.25 Watts. For maximum performance and execution efficiency the code was written entirely from the ground up as a ‘bare metal’ project. This ensured that there was the absolute minimum of overheads when handling interrupts or DMA transfers and that its operation was completely deterministic. It also ensured that the system had the spare capacity needed to continue to monitor and record audio whilst it was writing buffered wav files to the micro SD card formatted as a FAT32 drive. There was no direct support for the A5 processor in Atmel Studio at the time therefore development was carried out using Eclipse, the code was debugged and tested using a SAM ICE debugger and the final code was flashed into an onboard EEPROM using Atmel’s SAMBA deployment tools and a custom boot loader compiled on a LINUX box. The initial technical challenge was to build a functioning bare metal development environment from the tools available. There was a software development pack available from Atmel with example code provided but the documentation was sparse and the community support appeared to cover only basic tasks. As a result, there was a steep learning curve required in order to understand the processor architecture within the context of the build, debug and test environments used. The only other real challenge was that for some reason the supplied code intended to interface the micro SD card to the microcontroller using the built in HSMCI (High Speed Multimedia Card Interface) failed to work with block read and write commands using the internal DMA (Direct Memory Access) controller. As a result, a workaround was devised where the micro SD card was interfaced to the microcontroller using a spare SPI interface. This worked extremely well but was limited to a 1 bit data bus that restricted data transfer to approximately 10Mbps. At its highest sampling rate careful buffering of the audio data was then required so that it could continue to record whilst data was written to the card in the background. At sea the system worked as designed recording audio and FFT summary information to the micro SD card for the entire length of the deployment. It can be seen from Figure 1 below that the summary FFT information in the middle and bottom chart correlated exactly with the prevailing wave heights and current flows of the top chart which was derived from external data sources. The project achieved all of its goals and the results obtained were at least as good as those initially anticipated. The low power consumption meant that deployments could be extended and the capabilities of the system made it possible to examine background noise over much longer continuous periods of time than previously possible with such small portable equipment (in oceanic terms). At the time of writing, the next product is already being planned and is expected to make further improvements where it will reduce the systems power consumption by 60%, increase the storage capacity by 800% whilst simultaneously increasing the sampling rate by 100% and the resolution from 16 to 32 bits. Much of this will be achieved by the use of fewer, more highly integrated components.